What exactly is equine-assisted coaching, i.e. coaching using horses? Horses are prey animals with a strong fight-or-flight response. In nature, horses live in herds and are dependent on one another and the herd to survive. Horses continuously scan their surroundings for potential danger and the other herd members for emotional state, tension and other signals. Equine-assisted coaching involves the use of this natural behaviour. The horse reflects your body language, posture, mood and emotions. Horses are able to reflect the emotion that a specific topic or situation evokes in you. Giving socially desirable answers has no effect, since a horse will see right through this. The horse’s responses make you more aware of your own thoughts and feelings. It is always honest and without any judgement or prejudice. Horses simply respond to what they see and feel. The result of this reflective behaviour is an honest confrontation with yourself, enabling us to quickly grasp to the essence of your challenge. 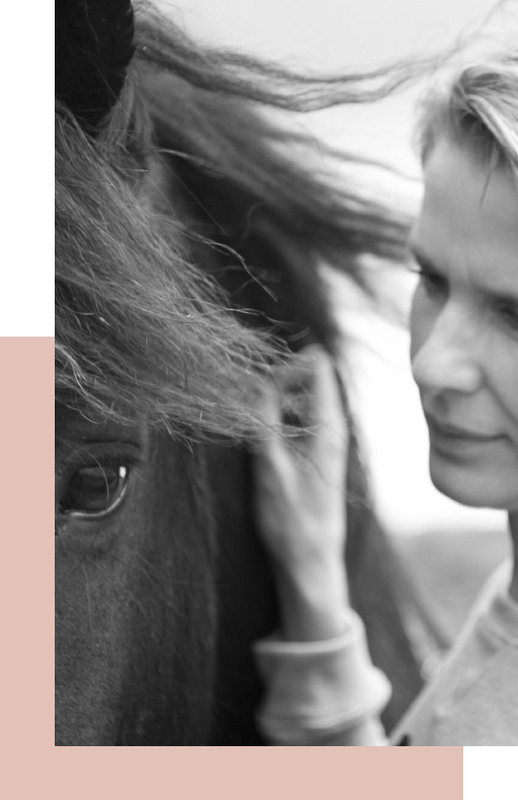 Equine-assisted coaching is an awareness process that offers insight into the thoughts and feelings that the person carries in his or her heart. Coaching is oriented towards the future. We conclude the coaching session with ways to apply what has been learned in your life. The insights gained during the session are converted into concrete steps that lead towards the desired change in everyday life. It goes without saying that the safety of both people and animals is top priority. That is why we only use well-balanced horses who are well suited for participating in a coaching session.